A good commercial property attracts customers. So, it is important to maintain and paint it beautifully. For painting your office, retail store or restaurant, choose an experienced commercial painting company that guarantees minimal disruption of work and provides you with high-quality results. Be it a retail office, an industrial factory, a condominium, or any other type of real-estate property, a clean and well-maintained commercial property is essential for business. If you are a businessman looking to update the look of your property, you can hire a commercial painting company and transform a dull commercial property into a dazzling masterpiece. Why is it Essential to opt for Commercial Painting? No one likes a dingy hotel, a shabby store or a dilapidated office. When a prospective customer or a potential employee comes to your office, he judges your economic condition on the basis of your commercial property. If it is dull, you will not be able to impress the customers and you will lose business. So, it is important to take good care of your property. Cleanliness is a virtue that is expected from a product-based business as well as a service-based business. Clean environment assures the customers of your adherence to hygiene standards. It also ensures the employees of safety and security. Customers believe that if a businessman cannot take care of his office, he cannot take care of his customers. So, it is important that you paint your commercial property and keep it clean. If you avoid the small cost of repairing damaged walls, rotten wood and peeling paint today, you will have to spend a large amount of money on repairs in the future. It will create a significant problem for the financial health of your business. So, repair the damages at the earliest and ensure the protection of your investment. Today’s commercial painting companies can help you in keeping your commercial property up-to-date. They not only paint your property but also take care of minor repair and renovation work. They will take care of damaged doors, windows, ceiling, stucco etc. and paint them beautifully. What Factors should be kept in Mind while hiring a Commercial Painting Company? Don’t choose an amateur painter. 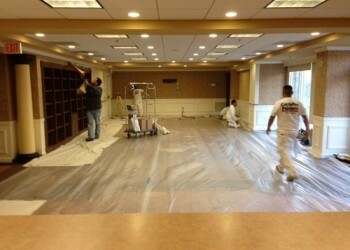 Select a commercial painting company in Toronto with experience of handling commercial properties. It will understand your needs and even suggest you the right colour for your office. A professional knows how important it is to cause minimum disruption to your work. So, opt for a painting company with a flexible work schedule. Choose someone who can work around your business timings. An experienced commercial painting company knows that communication is extremely important for a business. It will keep you informed about all the new developments and provide you with a clear picture of the work. Unexpected cost can create a problem for your business. So, it is essential that you work with a professional who provides you with a detailed budget and cost estimates. A commercial painting company uses high-quality paints and excellent painting techniques for better results. Also, it offers warranty for its work. If your painting company doesn’t offer warranty, negotiate with the supervisor. Your work-place defines your business. So, it is important that anybody who enters the premises is trust-worthy. Choose a painting company that conducts a background check of its painters to ensure that your employees, customers and visitors are secure. Spend time in finding the right commercial painting company for your property. Choosing the right company will transform a dull commercial property into a dazzling masterpiece in no time. Perfect Painters is famous for providing commercial painting services in Toronto and GTA. Quality service and excellent results are our forte. Contact the company today by calling on (416) 477-1400 or enquiring online for professional painters and renovation services.